The Arcadia Invitational wasn't surprising in that it played host to some of the country's best performances this outdoor track and field season. That's what happens when you put the nation's best athletes on one track, with little wind. You get #beastmode, over and over again. Historically, Arcadia has long made its name known in the distance races. On Friday, that took the form of three nation-leading races in the relays, with Great Oak's girls netting a No. 1 in the 4x800 (9:10.24), Long Beach Wilson's girls going No. 1 in the SMR (4:03.06) and St. Francis' girls grabbing a No. 1 in the 4x1600 (20:20.81). Let's take a look at Saturday's best performances -- check on MileSplit for a separate post on the 3200m races. Justin Robinson wasn't satisfied with his performance in the boys invitational 400 meter race on Saturday. That should tell you something about the high expectations of the country's top quarter-miler in 2019. 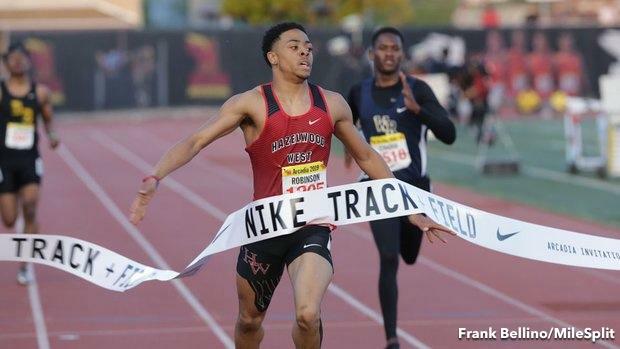 The Hazelwood West (MO) High School junior, returning to Arcadia after finishing second at the distance in 2018, raced off to a new US No. 1 of 46.22 seconds, winning by a wide margin on Saturday at Arcadia. Afterward, the defending New Balance Nationals Indoor champion felt amiss. "I think I did OK, but I still clearly need to improve on my race plan and strategy," Robinson said afterward. "I tried to go out pretty well and come back with something even and couldn't do it tonight. I fell out of my rhythm a little bit and paid for it." His time, however, is a significant improvement from where he was at this juncture last year. Robinson is over a second faster than his 47.24 from this same race, and his performance largely mirrors what he was able to do to finish off his sophomore season, when he went 46.20 at the USA Junior Championships and 46.21 at the USATF Junior Olympics. Robinson, who followed with a second-place finish in the 200m with a time of 21.07 -- finishing second to Benson's (OR) Micah Williams, who went 21.03 -- should be closing in on 45 any time now. The Greater Atlanta Christian (GA) junior, one of the country's top returners in the short hurdles, probably kept an eye on recent performances from St. Katharine Drexel's Alia Armstrong, who has dominated the 100mH for much of the season thus far. Jones needed to break 13.36 seconds. And on Saturday, she did just that. Jones put together her best race of the season, scoring a new wind-legal national lead with a time of 13.33 (+0.5) seconds, edging Silver Creek's Jazlynn Shearer, who was second in 13.36. That time marks a solid development from Jones, who went 13.49 seconds on March 30 at the Stanford Invitational. While Charles McBride was in North Carolina clearing 7-feet for the first time this season in the high jump -- a new US No. 1 -- a great development was happening at Arcadia. TinTinger was back in action after missing much of his sophomore season due to disciplinary reasons. The Helena High School junior ultimately returned to competition last spring following that break, winning his second straight state title in Montana before going on to claim another win at the USATF Junior Olympics. But he never quite reached the heights of his freshman season, when he skied for a freshman class national record of 7 feet, 1.5 inches. TinTinger won Arcadia on Saturday with a final mark of 6-11, a US top five mark. That performance could be the start of a fast rise for TinTinger. There's Matthew Boling, and then there's everybody else. But maybe that's not so set in stone yet. Clovis North (CA) junior Caleb Foster, like Boling before him, made a massive PR leap on Saturday in the elite long jump section, punctuating his second attempt with an incredible mark of 25 feet, 1.5 inches (+1.2). That jump was over a foot better than his previous best of 23-10.5, an attempt he logged on march 23 at the Central Valley Classic. This may be an especially potent year in the long jump, much like 2016 when five boys produced wind-legal marks of 25 feet. Consider that in 2018 no boy logged a single wind-legal 25-foot mark. If rivalries and duels are what make track and field compelling, then there was no better 1-v-1 matchup than the one that played out on the track between De'Anna Nowling and Arria Minor on Saturday. 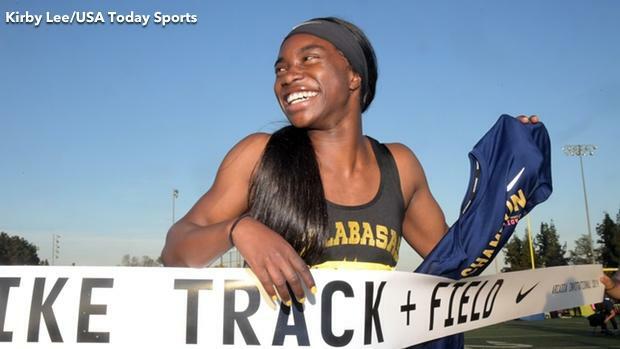 The Calabassas (CA) High School sprint standout went toe-to-toe with Denver East's (CO) Minor and walked away the victor in both the 100m and 200m. Nowling's brilliant block start and powerful drive in the 100m was enough to hold off Minor's top speed by a thin margin. Nowling finished in 11.54 (+0.7) seconds, while Minor followed in 11.57. In the 200m, with each even with about 50 meters to go, Nowling held her form longer at the finish line, leaning past Minor with a final time of 23.64 seconds (-0.9), with Minor following in second in 23.72.